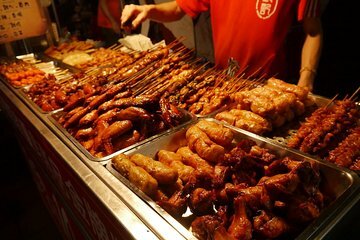 Get an authentic taste of Taiwanese cuisine on a food tour of the Ningxia Night Market. An informative guide leads you through the traditional market for a sampling of ‘shiao chi’ (little eats). Try local favorites like oyster pancakes, taro cake and pork leg rice among hundreds of street food vendors. Your guide makes sure you don’t miss a single bite on this small-group tour, limited to 12 people. Venture to the street food stalls of Ningxia Market with an in-the-know foodie guide on this small-group culinary adventure in Taipei. Go accompanied to the bustling night market from the MRT Shuanglian Station and tantalize your taste buds with up to five bites of local cuisine. After your guide describes the available food options, satisfy your appetite with mouthwatering dishes to sample alongside your fellow food lovers. Fried yam balls, flavorful chicken rolls with barbecue sauce, oyster pancakes, or tender pork leg served with rice and shrimp soup are just some of the scrumptious delights on offer. Vegetarians, too, can choose from popular dishes such as Taiwanese tofu and red bean soup. Throughout your 2- to 3-hour food walking tour, your guide recommends Taipei specialties and explains the significance of particular dishes in Taiwanese culture. Dare to sample local delicacies picked out for you and receive a special reward at the end of your tour! Afterward, you can either walk back to the MRT station or continue exploring Ningxia Market on your own. Got to walk the Night Market and sample the foods. Also got to learn about the foods we were not brave enough to sample. It was the weekend so the market was very crowded and noisy -- but that was part of the local experience. The guide was good at explaining what we were eating and suggesting local favorites that westerners might like. It was an interesting experience. Lovely guide Jonathan. Highly recommended to try some of the unusual food of Taiwan. Helpful guide to navigate Taiwan's night market. Plenty of choices for any dietary requirement. The tour never happened as your representatives never showed up. We waited from 6pm until 7:15pm at the meeting place. We went back and forth the main ticketing booth and the 2 entrances/exits of the mrt station. A few days prior to our tour we sent a email to your local partner operation and asked for specifics as regard exact location of the meeting place for the tour per instructions written on the voucher you emailed us. we never got a reply. We decided then to just arrive at the mrt station much earlier than the 7pm meeting time, hoping to be able to locate your local partner's booth, there was none. We asked the personnel at the mrt ticketing booth and they were unfamiliar with your local operator, even when we showed them our voucher and the name of your operator. At 6:30pm we were trying to call the telephone number of your operator however there was no answer, we must have tried almost 10times. I have used viator for my tours in other locations previously and I have been satisfied of your service. I booked tours through viator because I trust viator, and i expect that you have qualified your partners well. This experience has been real frustrating. That tour was supposed to be our 1st tour for the vacation, and on the day of our arrival. I sent you an email (through My bookings) on that frustrating evening but never received a reply. I hope this time around I can expect a reply from you at the soonest. Thank you.